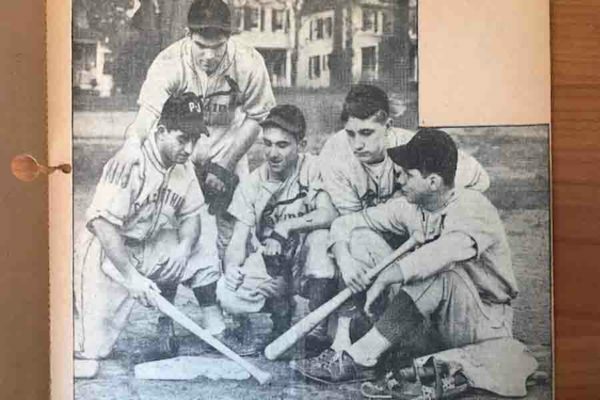 Bishop Bill Newman, right, is pictured in a newspaper clipping with his Calvert Hall teammates in the spring of 1946. The late Tom Steadman and I nearly came to blows one night at the Babe Ruth Museum. It was a year or two after the 2001 death of his brother, John, the legendary sports columnist for the News American and then the Evening Sun, may all rest in peace. Talk turned to the University of Notre Dame. The Steadmans worshipped the Fighting Irish. From the day in 1966 when Ara Parseghian had Notre Dame take a knee against Michigan State and Bubba Smith in a tie game to preserve its No. 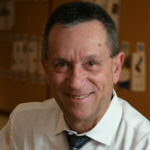 1 ranking, my father’s words about the lack of courage in that coach – and by extension, his program – rang in my head. As the banter got louder, Tom and I both had our Irish up a tad too much. Like the Steadmans, Bishop William C. Newman, who died May 20, came from a family that worshipped at Blessed Sacrament Parish, on Old York Road. John Steadman, two years older than his brother Tom and one year older than Bishop Newman, played minor league baseball before he became a publicist and newspaperman. While Bishop Newman passed on a similar opportunity to play pro ball, he never lost their shared passion for competitive sport. Bishop Bill Newman’s scrapbook from 1946 includes a poster advertising an amateur baseball game in Washington, D.C., in which his Baltimore Brigade team won, thanks to his two hits. Patricia Olin, one of his 24 nieces and nephews, loaned me a scrapbook her uncle began in 1946, the year he graduated from Calvert Hall. The Sun of Feb. 9, 1946, recounts his free throw with 45 seconds remaining that lifted the Cardinals to a 25-24 victory over unbeaten and two-time MSA champion St. Paul’s. That spring, Calvert Hall baseball took a backseat to Loyola High, which waited 71 years before claiming another championship in the sport this week. 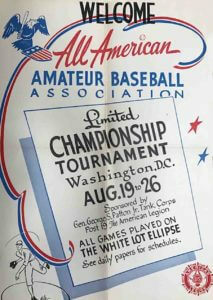 There are a few items about scholastic baseball in the scrapbook, and a lot about the Baltimore Brigade team that won the All-American Amateur Baseball Association junior championship, the AAABA having been formed by aeronautic pioneer Glenn L. Martin. In a 10-7 win over Washington, before 3,000 on the Ellipse in the nation’s capital, Bill Newman had two hits and scored four runs. Tom Steadman, a year behind him at Calvert Hall, came in to pitch relief in the sixth inning to clinch the win and the championship. Bill Newman began his seminary studies that fall, but did not stop playing baseball, as recalled by Jim Henneman, another jock from Blessed Sacrament and Calvert Hall, class of 1953. “I was a bat boy for Scherer Lumber Co., a team he played for while he was in seminary,” said Henneman, who became a colleague of John Steadman’s and still writes for Press Box. “He had the great respect of his teammates. I remember one time being in a car and picking up Bill to go to a game, and the driver, Ed Woelper, cautioning everybody to clean up their language. His first assignment of any length was at St. Elizabeth of Hungary in Highlandtown, where the 4-year-old parishioners included Trish (Williams) Cook. When she graduated from Archbishop Keough High School in 1969, she said, “he handed me my diploma.” Cook became a celebrated basketball coach at her alma mater, and several times when her teams played at Notre Dame Prep, Bishop Newman came to watch. Bishop Newman was not afraid to fraternize with the sporting enemy. For decades, morning Mass on Thanksgiving Day before the Calvert Hall-Loyola football game at the Homeland household of Bill and Joanna Baird was a tradition. At first, it was celebrated by Cardinal Lawrence Shehan, her uncle. Later, Bishop Newman accepted the honor, celebrating Mass for a family that sent all six of its sons to Loyola Blakefield.